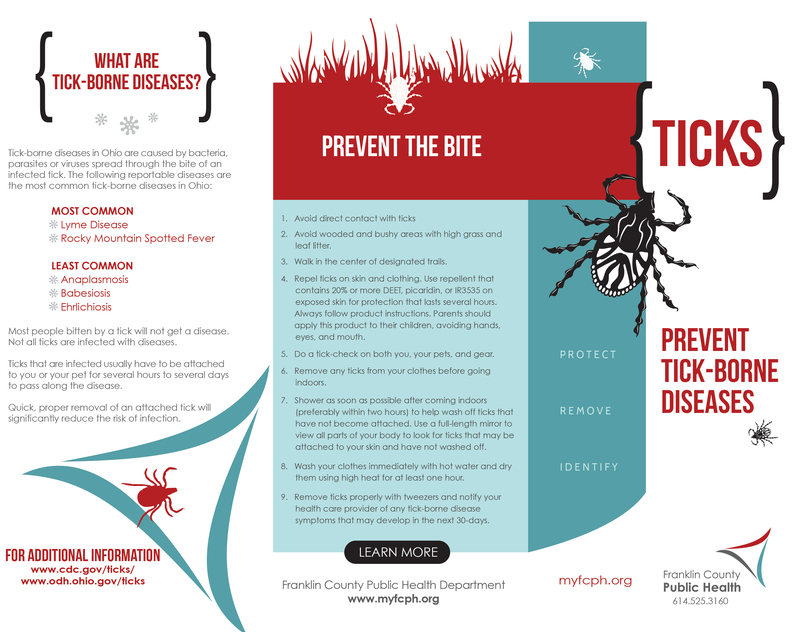 Ticks are abundant in the spring and summer months and it is important to protect yourself from tick bites and reduce your risk of tick borne diseases. Ticks are most commonly found in wooded and bushy areas and where there is high grass. Avoiding these areas is the best prevention, but insect repellents and wearing light colored clothing is also important to protect yourself. Learn more about ticks. In Ohio, there are three (3) diseases that that are of concern: Lyme disease, Rocky Mountain spotted fever and Ehrlichiosis. 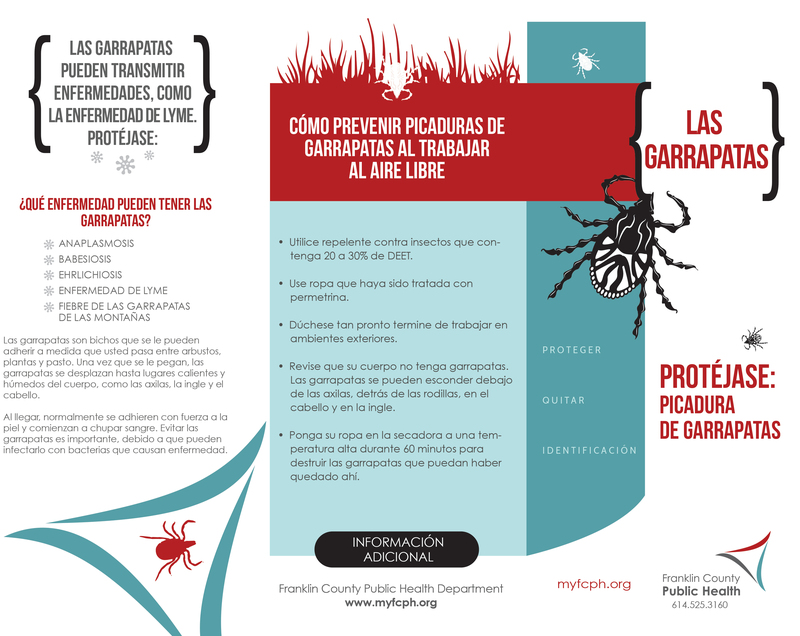 The Centers for Disease Control has very good information about ticks and the diseases they can carry. If you suspect you might have a tick transmitted disease, please seek immediate medical attention. If a tick is attached to you please take the following steps to remove it from your body. Can ticks be tested for disease? There are several labs that test ticks for a fee if you would like to do an internet search to find one in the area. 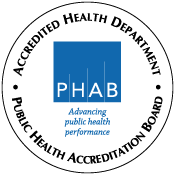 Franklin County Public Health cannot endorse a lab for you to use. FCPH will only accept ticks that were found on or attached to humans, not pets. Please contact your veterinarian if a tick was found on your pet. The tick must be removed from the person. FCPH will not remove a tick from someone’s body; please take the following steps to remove it. Please seek medical attention if unable to remove the tick. Ticks must be dropped off at our office lobby during business hours. We will not pick up ticks. Ticks must be kept and transported in a small air-tight container such as a pill bottle or baby food jar – no plastic bags accepted. We will only accept ticks that are in bottles or small jars. Place into the container with the tick several drops of rubbing alcohol and tightly seal the container. The person dropping off the tick will be required to complete the Tick Identification Submission Form. This form is also available in the FCPH lobby. FCPH will identify the tick in about 7 days. A written report will be sent to the person listed on the Submission Form usually within 2-3 weeks. This report will include the species of tick identified and what diseases are associated with it. If you have any medical concerns, please discuss the situation with a doctor. He/she should explain and advise you on the signs and symptoms of tick borne diseases. Click on images for printable versions (English and Spanish available).